The Christ’s Church baseball team with the Florida Miracle League, following last Saturday’s event together. *Photo courtesy of @CCAjax. This past Saturday brought the biggest game of the year for the Christ’s Church Academy Eagles. Off to a strong 11-2 start this year, Saturday was about a lot more than just baseball. 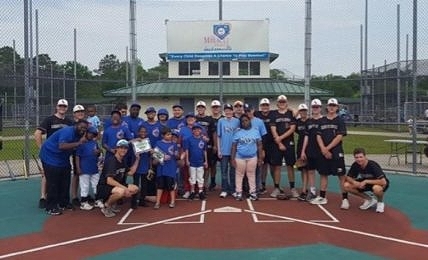 The team was welcomed to the field by The Miracle League Jacksonville, a program that helps special needs children and adults get on a turf baseball field and play. The Miracle League is for kids and adults that have special needs and want to enjoy the thrill of playing baseball. Games generally last an hour and are run where there are normally two teams playing against each other, and each person bats every inning. When the last batter hits, they all clear the bases, so everyone gets to score. When someone volunteers, they are a “buddy”. The league matches them up with a kid or adult from the league and they help that player hit, if necessary, run the bases, and help them field the ball. It was an unforgettable experience that left a strong impression on every member of the team. 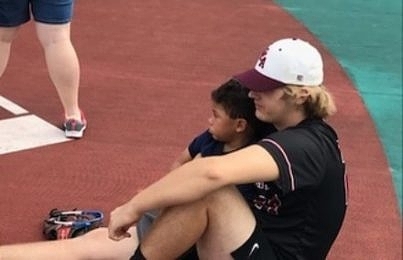 The Miracle League players fell in love with the Eagles and formed immediate bonds, and the atmosphere at the field was incredible all day long. The event came to be in part thanks to Eagles assistant coach Mike Skoglund, who is on the board of directors for The Miracle League Jacksonville, along with his wife. In a January coaches meeting, Coach Skoglund brought up the idea of going to help one Saturday once their spring season began. All of the other coaches were immediately on board and they made plans to go a weekend in April. The Miracle League believe that every child deserves a chance to play baseball, regardless of their abilities. They cannot change or cure the medical issues life has dealt them. What they can do is provide them with an opportunity to experience the joy and benefits that come from playing baseball. In this league, each team and every player wins every game. Being there immersed in the experience together, it certainly felt that way to the Eagles. Just as the league says, it is more than just a game. Baseball is an experience every child deserves to enjoy, and for the Eagles players that get to take the field every day it was a reminder of just how special it is simply to be able to do that. Sharing the joy of baseball together is as inspiring as it can get for any ball player. Through the Florida Miracle League, dreams really do come true. To the players serving host to the Christ’s Church team on Saturday, it felt like they were welcoming the Miami Marlins. The Eagles appeared to be stars to them, which only further inspired them to be like the players they were seeing in them. 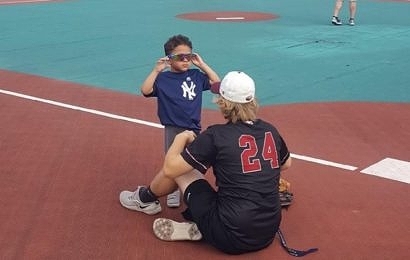 To be inspired on the baseball field is perhaps the most amazing feeling any ball player could ever ask for, especially when those players in turn worked to further inspire the Eagles as well. The Miracle League Jacksonville has a spring and fall season. To find out more information on ways you can help, please visit their website HERE.